That pretty much describes the group known as the Polyphonic Spree, that large group of joyous robed Texans who toured around, starting at the beginning of the century, and recorded three albums, including one with Disneyland Records. Founded by lead singer Tim Delaughter, formerly of the band Tripping Daisy, they are back on tour and were back in Los Angeles Monday night. The first time I experienced the Spree was as a young lad living in Washington, DC. I was working door staff at the 9:30 Club, and watched that night from the top of the house near the artist dressing rooms. Working door staff meant watching the crowd, and each night brought a different vibe, a different call-and-response energy produced by performer and crowd. But this night was something extraordinary. These people were so happy! “It was great!” And it was. And after the show, when the place cleared out except for me and the band, two girl choir members—a couple of the most beautiful, free, aquarian girls I had ever seen—invited me to some after-party at the Velvet Lounge. But after work, I couldn’t find it! I went home and was simultaneously devastated, and in love with those girls, and that band… I wanted to run away from home and join the happy music cult. The set and the group looks like it was drawn by Marijke of the Fool, their robes now and adorned with red hearts at the chest (sorta like Tenderheart from the Care Bears) and an assorted rainbow of colors on the bottom. It’s all so melodious, unadulterated and boundless. Early on, Delaughter spazzes out a little, almost, to himself, to channel that state of mind, to lead these people to the promised land, the implied land, the land that these people obviously still love and long to go to, that they get to when they listen, on headphones at their office jobs, at home, on a run… Maybe their parents are Spree fans, maybe none of their friends will open up to it, or are ready to. It’s not trying to be hip place, it’s just a land of joy and love. After a couple of songs, people are jumping, singing along, dancing, feeling genuinely embarrassed but not caring, because it’s all so beautiful. The band is incredibly entertaining, but I find myself again watching the crowd at least half of the performance. 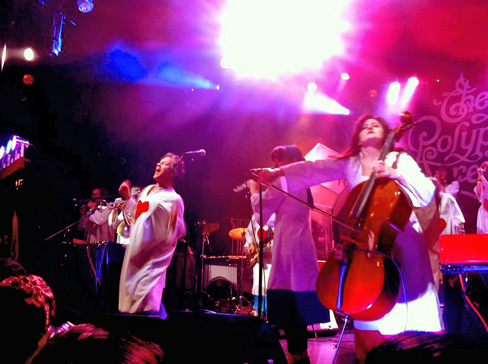 To see that group of people transformed from an un-enchanted conventional reality mindset to wherever it is inside that the Polyphonic Spree allows them to go, and to see it all set free, is really beautiful and moving. The songs were mostly from the albums, the first two of which I am more familiar with, so I can’t really attest to whether there were some new songs, or if they were from the third album; but all of the original compositions were great and expansive. They played one cover of the Who’s “Pinball Wizard” that seemed forced, and personally I did not care as much for it–but then I don’t like the Who. And that was towards the beginning of what was a long set and extensive encore that left the crowd feeling high. At the end of the performances an interesting visual and sonic effect had each band member departing, one by one, allowing that member to be applauded as his or her contribution was now apparent in its absence. At the end of the set the polyphony was subtracted down to just the harpist and Delaughter, joyously prancing about playing instruments, duetting with the harpist. After the final encore song, “The Championship,” it was down to just Delaughter, duet-ing with the audience, as we sang along: “All in good time raise our voices.” If those voices are uplifting, loving and inspiring, let that time be now. WIN TICKETS TO CURRENT JOYS + MICHAEL VIDAL AT THE EL REY ON SAT. DEC. 15!